k or side with the affected ear up, lightly pull back the ear and apply the drops. Try to stay in that position for 3-5 minutes to allow the drops to run down the entire ear canal. Sometimes the ear canal can get so swollen that ear drops won’t go all the way into the canal. In these cases, an ear “wick” is placed in the canal to facilitate the drops getting to the infection. Occasionally oral steroids might be used if the swelling is severe or if the swelling extends past the ear canal. Oral antibiotics may be used if the infection has spread into the surrounding tissue causing a cellulitis. Although bacteria cause most cases of otitis externa, sometimes fungal infections can be the cause. Thorough cleaning of the canal is then necessary to remove as much of the infection as possible before prescribing drops or ear “rinses.” Although not an ear infection, dry skin from a lack of cerumen or eczema can cause itching and flaking of the skin around the opening of the canal or inside the canal. This can usually be treated with steroid ear drops or creams. 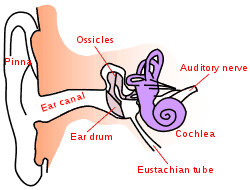 A more common problem associated with the ear canal is wax (cerumen) impactions. Ear wax serves a useful purpose in keeping the canal skin healthy and for fighting off infections. Too much wax, however, can can lead to blockage of the canal and affect hearing. It can also cause ear pain, itchy ears, and tinnitus (ringing in the ears). In these cases, the cerumen needs to be removed. Although Q-tips are widely used for cleaning of the canal, they tend to push the wax deeper into the ear canal making it more difficult to remove. Over-the-counter kits containing an irrigation bulb and a peroxide-type drop can be helpful. If this doesn’t work, a qualified practitioner should remove the cerumen. Techniques to remove the wax may include irrigation, curette, or suction leaving a healthy ear canal.